Self-proclaimed Opposition leader Dr Ekuru Aukot has recounted how NASA leaders, especially Raila Odinga, frantically tried to persuade him not to vie for the presidency in the fresh elections. 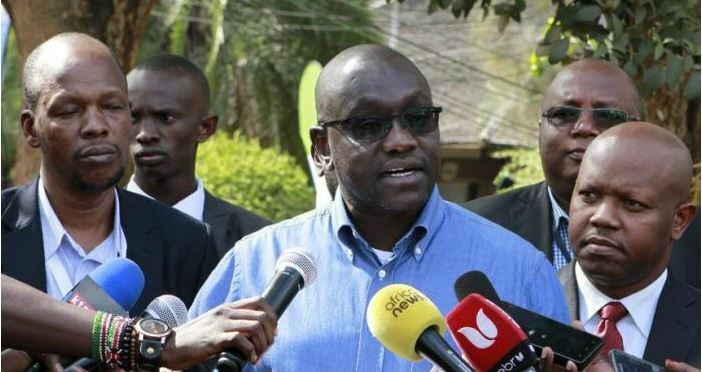 “Mr Odinga lobbied me not to participate in the election under the understanding that if I boycotted like he had done, it would cause a constitutional crisis because, according to him, Mr Kenyatta would not have competed against himself,” Aukot said. “After our first meeting, Mr Odinga would call me again. We went on a lunch meeting but I told him that the so-called abandonment will only give President Kenyatta a direct win without a contest,” he is quoted as saying by Nation. The Thirdway Alliance leader further revealed that NASA coprincipals Kalonzo Musyoka and Wetang’ula also called him for a meeting. They told him to withdraw the petition he had filed challenging the decision of the IEBC to block him from the race so as to deny President Kenyatta the much-needed legitimacy. “But I explained to them that if Uhuru fails to get a challenger, he would be declared the winner as it happened to Kikuyu MP Kimani Ichung’wah, among others. There was a precedent but these people thought that they were going to pocket and control me,” Aukot said. Ekuru noted that the decision to challenge the legality of the IEBC decision was to protect the Constitution and not about his individual interests. “I felt that my political rights were protected by article 138 of the Constitution. I am my own man and I don’t even support what Jubilee is doing because they have officialised the theft of public funds,” he said. He also denied that he had been bribed by the Jubilee leadership to participate in the repeat polls. Dr Aukot, however, described Odinga as one of his best friends despite having different political ideologies.